Our feature this month takes you behind the scenes at "Sudberry House", conceived by two individualists with passions so consuming that together they built their business around them. Meet Tom and Judy Beers who managed to merge their creative talents and business skills to forge an enterprise, combining the best of both worlds, into a business that has been a driving force in the needlework industry. Many a designer have Tom and Judy to thank for launching their careers, providing them with support and for discovering them as new talent. And as two of the kindest and most generous folks in the business, many people would not be where they are today, had it not been for Tom and Judy. For Tom, being a marketing executive for the plastics division of corporate giant, Allied Chemical, was not exactly the stuff dreams are made of. Judy knew that Tom did not relish the politics that corporate work entailed, but had reservations about "rocking the boat", being content with her lot as mother to Lynne and David, housewife and community volunteer. Nevertheless, what emerged was something quite different and rather more compelling. The seed that was to grow into "Sudberry House" began with their hobbies: woodworking for Tom and in Judy's case, stitching in the form of needlepoint and crewel embroidery. 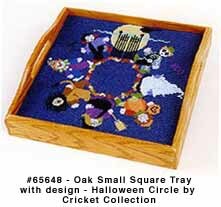 These pastimes provided outlets which satisfied their joint need for creative expression. After 18 years at Allied, Tom's yearning to be in business for himself became impossible to ignore. The obvious stumbling block was what could he make that would sell? Putting their heads together, they came up with a winner! 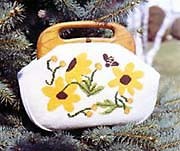 Judy had been making Bermuda Bags, which were then in vogue. She bought the wooden handles in Cape Cod. That business had closed and Judy suggested that Tom make the bag handles. She approached the owner of "Golden Eagle Fabrics", where she was a customer, with a prototype and he committed to buying some. Tom had a product and his first sale! The wood shop was set up in their garage and they named the fledgling business after the street they lived on: Sudberry. 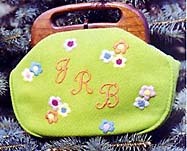 In 1968, they placed a small ad showing a Bermuda Bag made of linen, sporting a monogram and finished with cherry handles, in McCall's Needlework and Craft Magazine and were literally deluged with orders. For 4 years this was Sudberry's sole product, but the demand was so great, they could hardly keep up with supply. This presented a dilemma. Tom had kept his job, limiting the time he could devote to the business; Judy put in what hours she could. There was too much business to continue part time, but not enough for full time. They decided to either give up the business altogether or commit to it exclusively. Their entrepreneurial spirit won out and the die was cast. Space, as in operating the business from their garage and basement, became an issue: time to jump the next hurdle. They rented a 4000 square foot building. By 1975 the years of blood, sweat and tears had paid off. With a little help from the Connecticut Development Authority, Judy and Tom were able to begin construction on a 23,000 sq.ft. building in the Colton Road Business Park. The year 1976 proved them prescient but ahead of the times when they added the first item to be paired with a cross stitch pattern. 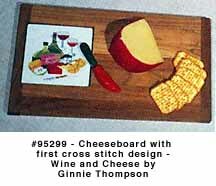 This was a cheeseboard designed by Ginny Thompson, now revered as the "Mother of Cross Stitch." 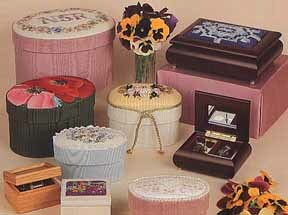 Although cross stitch is a much more accessible form of needlework, it wasn't until 1980 that it caught on. 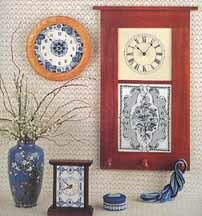 Over the years Tom and Judy collaborated with many accomplished needlework designers in combining charted designs with each product. They initiated a series of books spotlighting individual designer's works. The very first of these, Sudberry Series # 1, published in 1981, featured Lois Caron's original painted canvas designs converted into charts. Most of Judy and Tom's instincts in growing their business have been right on target because of a close interaction with their market. This, coupled with a strong work ethic, positive attitude, quality workmanship, attention to detail and emphasis on customer satisfaction have all been essential to their well deserved success. From one single item in 1967, Sudberry House has mushroomed into a business selling to over 2500 shops, offering over 250 products and charted designs to a needlework market throughout the world. Judy is insistent on pointing out that, of all the various trades they have worked with, their most rewarding and satisfying relationships have been with members of the needlework industry. 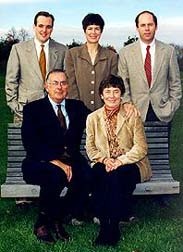 Judy's and Tom's son, David, joined the family enterprise in 1993, bringing to it his own expertise in computer technology. David is responsible for setting up their website at http://www.sudberry.com and keeping them on the cutting edge of the technological trend. His involvement made it possible for Tom to retire in 1996. Judy is as much as ever involved on a day-to-day basis. In pondering the pros and cons of working with a spouse, Judy feels the dynamics of being in business together and sharing the same goals have added a valuable dimension to their marriage and made it more cohesive. As an aside, she adds, that the thick cement wall which was built to completely separate the office from the workshop, as required by fire codes, has played no small part in their enduring success as business partners, as Judy took charge of sales, marketing and other office functions while Tom oversaw shop production on the other side! As a benefit of Tom's retirement, he and Judy have finally been able to use all the accumulated free air miles, earned traveling to trade shows, to finally explore the world for pleasure. Their most recent adventure, as intrepid tourists, took them to Peru. When asked if she had any advice for aspiring entrepreneurs, Judy lamented that "many people are too timid and sometimes you just have to forge ahead. If you have an idea you believe in, you have to take a chance." She admits that they were lucky to have a product which was geared to an emerging market and she stresses that timing is essential in any business venture. To achieve one's goals requires striking a fine balance between pragmatism and impetuousness. Sudberry operates a factory seconds and needlework outlet store for the public, where one can grab up tremendous bargains. Their blowout garage sale takes place once a year, each Saturday throughout August. As the summer of 1999 will be their 25th Anniversary of this event, it's sure to be even more spectacular than usual.